You're looking out onto rock formations from the beginning of time! And please, check out the color of the sky :) I still get excited everyday when I go for weeks without seeing so much as a cloud. Let those foolios live in England, I like the sun! 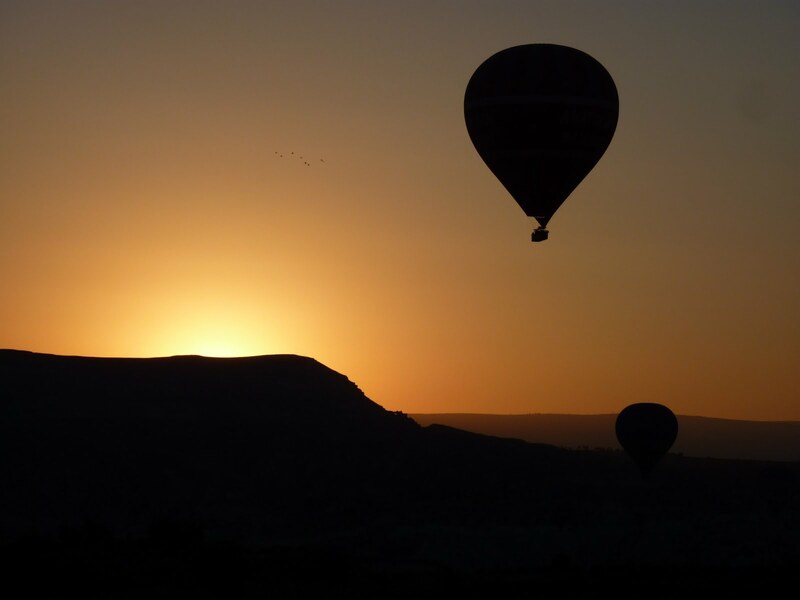 Turkish people celebrate the end of Ramadan with Seker Bayram (Festival of Sugar), which means an extra long weekend where Turks go on holiday or spend time with their family and eat lots of chocolate. We had Wednesday, Thursday and Friday off work, so new foreign teachers went to Cappadocia on holiday. 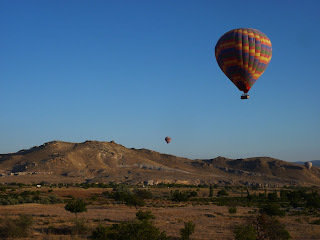 We left on Thursday morning and arrived in Cappadocia in early afternoon. After lunch at a pretty park we walked through a little village (if you could call one dusty hill full of shacks a village) to a church built into a rock that remained from the 11th century. This particular church was not even protected or being restored by the government, we could just walk right and and touch the ancient frescos. I briefly though about chisling out the last supper fresco for my living room, since I am redecorating, but thought better of it. Next up, we went to an underground city. Inhabitants of Cappadocia from the Bronze age built these underground cities to escape volcanoes and wild animals, and the cities were also used by Christians to escape from Roman soldiers in times of war. Sometimes people lived underground for 9 months at a time, but don't worry they made their own wine so I imagine they passed the time pretty easily. 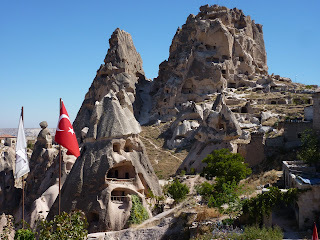 Cave houses. Yup, someone actually carved this out using a spoon. After supper at our hotel we went into a little town where we had drinks on the roof of a cave bar, and Laurel and I bought some pretty pashminas from a little shop. The next day we went on a very long hike through these 11 century ruins. 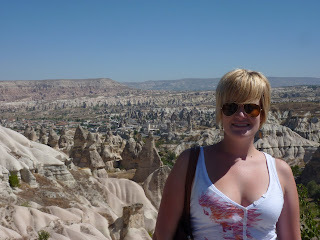 There were tons of caves that housed pigeons. I'm not sure why people in the 11th century bothered to carve holes out of massive pieces of rock, likely using spoons as their only tools, so that pigeons had a place to hang out. I must have dazed off when the guide was speaking. I think they used pigeon poop for something. As fertilizer, perhaps? 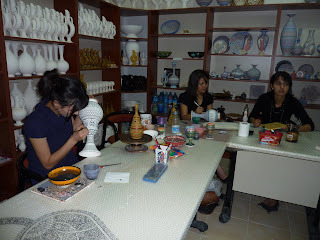 We went for lunch then to this really cool pottery place where pottery is made in house and then hand painted by local women. They make replicas of designs that date back to the Hittites (who I should know more about, but honestly, I must have dazed off during Medieval Europe history class as well). I bought a couple of Hittite bowls and a couple of pretty little blue Turkish design bowls as well. Think long and hard, Laurel. This could be you. After visiting a local winery called Tursan (Laurel and I bought a bottle of chardonnay - It was cheaper than room service. We're saving money!) we headed back to our hotel for a chill out and to get ready for Turkish Night. 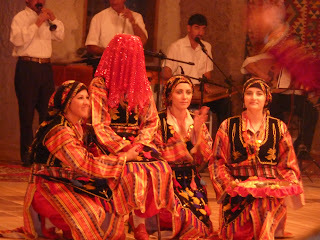 Turkish night is a party for tourists where local dancers and musicians perform traditional dances from all over Turkey (each city has their own dance). They also performed the dances from the traditional henna party (something like a bachelorette?) where the Turkish bride is covered in a red sequined veil and her bridesmaids paint her with henna and her husband to be shows off for her by doing tricks. At first, I thought this was pretty fun (I enjoy belly dancing) and begged Laurel (who may be marrying a Turk in the future) to let me be her bridesmaid. After a while though, I began to change my mind 'Ummm....Laurel, I don't know about this, it's all a little bit...ummm....' Well, see the photo for yourself...the girl can't see from under the veil for goodness sakes! And her hands are covered in mittens! One bonus to Turkish Night was that it was all-you-can-drink, so I had no problem busting out a few belly dancing moves after a few sips of Rakı (pronouned Rack-uh) a supposed 80% alcohol content liquour that possesses the revolting taste of black licorice. 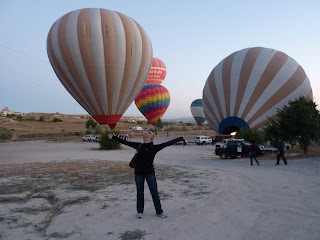 At the air balloon airport. Getting ready for take off. 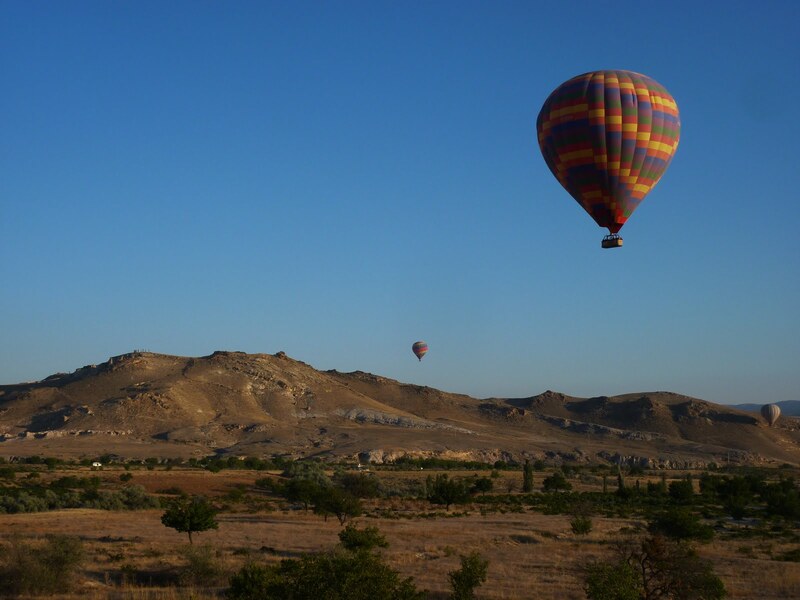 Ballon ride over Cappadocia. The colors here are stunning and the photos don't actually do justice.